Out of Lyons, Colorado - into Wyoming. Anybody who has been watching the news has seen how four or more straight days of rain being pumped into the Front Range of the Rockies has caused severe flooding and damage, with major impact to my town of Lyons. A 180-degree panoramic view of Rt 66, the only thoroughfare out of Lyons to the east. The left side of the image is eastbound towards Longmont, the right side is westbound into Lyons, with Steamboat Mountain on the horizon. At center, the raging St. Vrain River continues to chew on the south margin of the road. A vehicle lays stranded on the 5th Ave. bridge as the south fork of the St. Vrain River rushes just below street level. Further up the S. St. Vrain Canyon, Rt. 7 was washed out in multiple places, blocking access into the mountains and Estes Park. 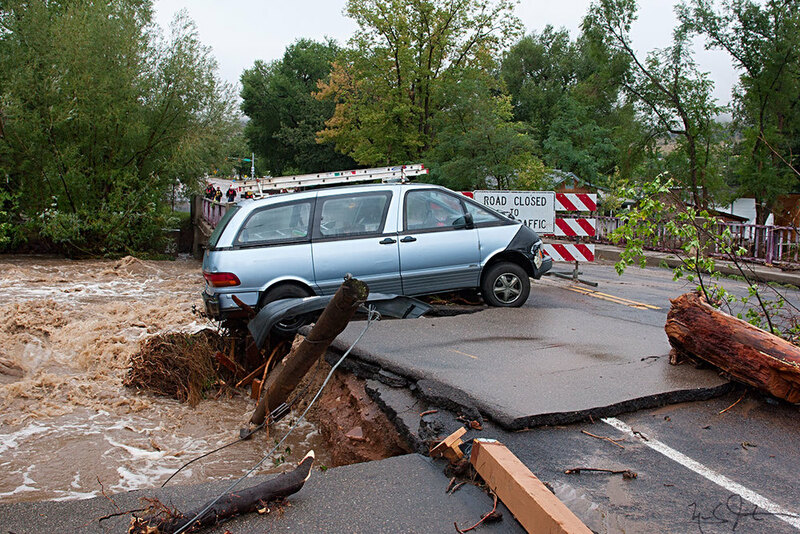 Many low-lying neighborhoods were inundated as the St. Vrain River overran its banks and even cut new channels through the town of Lyons, Colorado. After being trapped in town by the destruction of large chunks of Hwy 36 between Lyons and Estes Park, damage to the bridge on Rt 7 out of Lyons to the west, and severe flooding on Hwy 66 going east, residents of Lyons were asked to leave on Saturday 14 Sept. Residents trapped in Lyons by road washouts and floods get the word from the Sheriff's department and City Administration..
A Blackhawk helicopter sets down on Main St. I was planning to start a vacation today anyway, so I just left a couple of days early. I don't know if I will be able to go home to Lyons when my vacation ends, but in the meantime, enjoy a few photos from somewhere besides Colorado. Thanks to everyone who expressed concern about my well-being during the last several days, and thanks for all of the kind words and positive feedback about my photography and this site. Time-lapse video of the Teton Mountain range illuminated by the morning sun. From Oxbow Bend. A wider panoramic view from near the same spot. Link. Published on September 16, 2013 by Mark Johnston.